130 in Jacksonville march on Rep. Crenshaw's office, demand "Hands off Syria" | Fight Back! Protest at Congressman Crenshaw's office to demand "Hands off Syria". 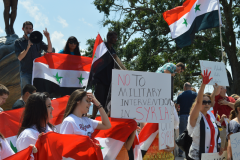 Jacksonville, FL - More than 130 protesters, including more than 70 Syrian Americans, gathered in Jacksonville's Memorial Park and marched on Congressman Ander Crenshaw's office to demand "Hands off Syria" on Sept. 7. Organized by Jacksonville Against the War on Syria (JAWS), the protest demanded that Crenshaw and Congresswoman Corrine Brown vote no on authorization for President Barack Obama's proposed military strike on Syria. Members of the Syrian American Forum, Veterans for Peace, the North Florida Central Labor Council, Occupy Jacksonville, the Freedom Road Socialist Organization, the New Jim Crow Movement, the Jacksonville Progressive Coalition and Gainesville Students for a Democratic Society attended the rally, along with many concerned residents from the Jacksonville community. "I am against any intervention because, first of all we will be defending, arming and fighting alongside al-Qaeda - the same al-Qaeda we have supposedly been fighting against in other countries," said Angela Abdulnour, a student at University of North Florida. "Second of all, the U.S. should spend the billions this attack would cost at home where it is more needed. It's important to rally and have our voice heard because if we don't, we will be allowing our leaders to make decisions that are only in their own interests and not in the interests of the American people and the Syrian people." The rally started midday at Memorial Park, in the Riverside neighborhood. Carrying Syrian flags and rally signs reading, "No authorization for war on Syria," the energetic crowd listened to a diverse stack of speakers who talked about the negative effects of U.S. war on the Middle East. "Are we spending money on education in Syria?" asked Wells Todd, an organizer with the Jacksonville Progressive Coalition and a Vietnam-era veteran. "Are we spending money on health care for Syrians? No! We're spending money to kill Syrian men, women and children, just like we did in Iraq." 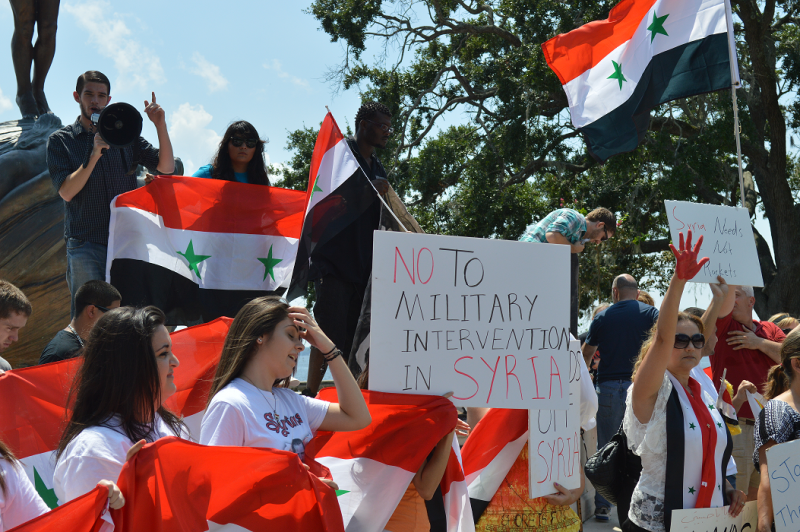 Protesters carried Syrian flags, some with pictures of Syrian President Bashar al-Assad, and a group of Syrian American students from University of North Florida wore shirts with Assad's image. Loud chants of "Hands off Syria!" and "We want peace! U.S. out of the Middle East," energized the rally as protesters set out on the quarter-mile walk to Crenshaw's office. When the protesters reached Crenshaw's office, which was located in a dentist's building, they gathered around the glass door entrance. With no one from Crenshaw's office present to hear the demands, people began taping their signs to the doors and windows. JAWS organizers passed out small cards reading, "I do not support President Obama's strike on Syria. Neither should you, Rep. Crenshaw," which each person signed and taped to the door. One sign featured red hand prints, symbolizing the blood on Congress' hands if they approve Obama's strike on Syria. Within minutes, rally signs and signature cards covered the entire entrance. The protesters then marched to Five-Points, an intersection of five streets in the heart of Riverside. Within minutes, they covered all five corners of the street block, and four people climbed onto the center stoplight to hang banners and the Syrian flag. They chanted, "Obama, it's not your business," and "U-S-A, stay away!" Dozens of cars drove by and honked and a few stopped to shout their support from the car. Customers at nearby restaurants came outside to see the rally and voice their support, with about 15 new people joining the protest. When the police showed up, the protesters refused to back down and continued chanting at the street corners. After more than 30 minutes at Five-Points, the protest marched back to Memorial Park and heard several other speakers. George Samara of the Syrian American Forum talked about traveling on Sept. 9 to Washington D.C. to protest the proposed military strike. Many protesters voiced cautious optimism that Congress would not authorize Obama's proposal. "If Obama is saying he wants to attack and has the authority to attack even without the support of the Congress, wouldn't he be a dictator?" asked Abdulnour. JAWS also announced a statewide call-in day to Senator Bill Nelson and Marco Rubio demanding no authorization for war on Syria, in conjunction with the Miami-based People's Opposition to War, Imperialism and Racism (POWIR).